Earlier this month we wrote about the benefits of outdoor play and healthy risk. 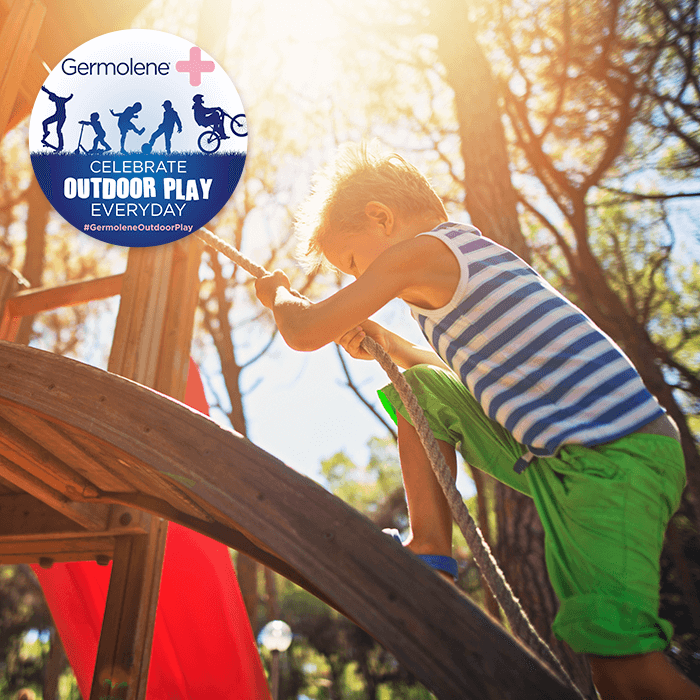 This is after new research conducted by Germolene Antiseptic Cream* showed that 95% of parents recognise the benefits of outdoor play to childhood development such as physical exercise, social interaction and cognitive skills. It also emphasises that there is very little rejection of the idea of free, outdoor childhood play (even if it brings in some risk) with 72% of parents believing that experiencing occasional cuts and grazes is important for childhood development. How do we actually make outdoor play happen for more children, more of the time? How do we overcome the barriers that prevent it from happening? To discover the real benefits that added wild, outdoor time for school children can have, we spoke to Zosia Brett, a Forest School leader and Outdoor Learning Practitioner in Bath, UK to hear about how she has incorporated outdoor play into the schools she works with and the benefits she has seen in the children as a result. I’m a Forest School and Outdoor Learning Practitioner, based in Bath, UK. I initially trained in landscape design/architecture, followed by a PHD in cultural/social attitudes to the environment, then worked in community participation work. After having children I became interested in the school connection and trained as a Forest School practitioner. I’m currently working with two state primary schools amongst other projects. What are your own memories of ‘wild time’ growing up and being outside at school? I grew up in Dorset and there was a lot of heathland around our school. I remember doing cross country, making plaster casts with heath mud. The smell of heathland still takes me back. There was a wood behind our house where my teacher Mr. Orchard used to take us outside for reading under the pine trees. I remember those books more than many others, maybe because the senses are heightened when you’re learning outside. This is actually the question I often ask teachers I am working with and most of them say they don’t really remember being outside at school, but they do remember rushing outside as soon as they were home. It feels like this generation is almost the opposite. Why do you feel that wild time and outdoor play are important? It makes children (and adults) more able and confident - I’ve read and seen evidence of this. It’s interesting that people accept their children need swimming lessons to stay safe in the water, but don’t realise that children need outdoor time in the same way to learn to navigate physically in life. Mollycoddled children are more likely to be anxious and accident prone, whereas repeated exposure to outdoor play builds confidence. Generally, the more risks children are allowed to take the more able they are in applying themselves to different tasks and challenges. Why do you think are we seeing less of this and what can we do about it? I think there is a fear felt by some parents that by letting children play outdoors they could be exposed to risk and this could reflect on them negatively as parents, making it look as if they aren’t caring properly for your children. There’s almost a dread of looking like a bad parent if you’re letting your kids play out in the street on their own because you’re not entertaining them, or taking them to a club, or on holiday, but they’re probably having a great time! How have you incorporated wild time into the daily rhythm of your schools? I tend to spend one day a week with classes on rotation. Sometimes it’s small groups, sometimes the whole class and often the teachers are keen to participate and learn too. With the little ones we create lots of fun outdoor games, we also aim to make it curriculum based as this helps the teachers embrace it and worry less about not being specifically ‘forest school’ trained teachers, as any teacher can incorporate more outdoor play into the school routine. With the older children we try and link to what they’re learning about. A recent example is where the children were learning about Florence Nightingale and the Crimean War, so we set tents up outside. The children divided responsibilities by deciding who was going to look after whom, and who would empty poo buckets etc. Two months later they were still enacting and playing it amongst themselves. We had a project where the children had to find out about an explorer they found exciting. We made an outdoor theatre with props and they put on a play about their explorer and performed it to the class. They were also working on a project about habitats, which we decided to focus on with outdoor play, as the classroom results hadn’t been great. We explored local habitats - woods, grassland, school grounds, and made models with clay and sticks etc. This activity had a big impact on the results. Alongside this, we also explored more traditional Forest School activities including fire, dance and music too. The work with the junior school has been more focused on lunchtime play and the playground as broader outdoor space is limited. Firstly, we organised two big sheds and collected lots of props to fill them with, including pipes, building waste, kitchen equipment, suitcases, wheelbarrows, bizarre hats, shoes – anything we could get our hands on. We also have links to a charity shop who give us things they can’t sell. Having this equipment, has transformed playtime. This has enabled the children to engage in lots of creative activity, using the various items of equipment and using their imaginations to transform items into something or use it to create stories of outdoor play. For example, there was a group of children who envisioned that they were generations of a family, who pretended to go on expeditions using the equipment as props. We’ve also built a kinetic wall with hammers, pipes and other bits of metal. Was this an easy process or were there barriers in place? It’s a gradual process, but drip feeding and allowing outdoor play to grow organically helps it become really embedded. At the end of the day it’s also about the teachers, not just the kids, feeling more empowered. I want teachers to feel empowered and inspired to try to introduce outdoor play where possible, as they are guaranteed to see the benefit for the children with each session. For example, I’ve worked with one teacher who used to do 10 minutes ‘wake and shake’ in the playground at the start of the day, he was really engaged with it and would put music on, the children were also really engaged. He’d also take the class out for 10 minutes if they seemed sleepy or needed waking up, which they all loved! Mud is another potential barrier, but it’s making sure appropriate clothing is there and that parents, teachers and cleaners understand and don’t mind a bit of mud. I understand one of the school’s you work with is rated by Ofsted as outstanding; did that make it easier or harder to introduce outdoor play? I don’t really have anything to compare it to because both the schools I work with are outstanding, but if anything I think it makes it easier. I personally find that when the basics are sorted, it allows teachers to look at what can be improved on next. Some of the changes were just a natural progression, for example other subjects were already being taken out of the classroom, so it was a natural progression to take it outside. With the playground work, I have noticed he children are more confident, and generally the more time they spend outdoors the more they embrace it. The playground work has been the most visual for parents and has been extremely well received. We had an outdoor open day with staff and kids spending time outside with the parents and all the feedback has been really positive - parents love it. Do you have any tips for teachers and/or parents looking to incorporate more outdoor play into their children’s lives? A playground scheme is brilliant because it is all self-led and as it’s not during lesson time and so doesn’t affect classes, but it gives teachers a chance to see what the children can do at their own pace, which can feed into lesson planning. At home try and make it as easy as possible for kids to get outside. There are simple, small things you can do as a parent, for example if my children’s Crocs are by the back door they’ll go out into the garden - if they’re not, they’re less likely to! Outdoor toys and games also create further encouragement, as well as family time spent outdoors. If this has inspired you, Germolene is offering you the chance to nominate a primary school for the chance to win one of two £5,000 grants towards outdoor play equipment for your child’s school, giving them the opportunity to spend more time enjoying the great outdoors. **Terms and conditions apply. Competition is open to residents of the UK, over 18s only and closes on 02/10/2017. For full terms and conditions visit: https://www.mumsnet.com/competitions/competition-terms-and-conditions.